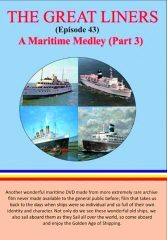 With the use of more rare archive film never made public before, this 75 minutes long DVD will give you the chance to experience a truly wonderful maritime feast. Film that takes us back to the early 1960s to board General Steamship Companies Royal Sovereign on a voyage from London’s Tower Bridge Pier down through London’s docklands in their heyday. Then it goes back to 1946, where more rare film allows us to witness the maiden voyage to New York of the magnificent Queen Elizabeth. This is an outstanding book commemorating the final voyage of wonderful vessel in minute detail which makes fascinating reading and I would very highly recommend it to our readers. It then covers the maiden voyage of the QE2, followed by film of a voyage on Grace Line’s Sant Cecilia on a voyage to Chile. These DVDs are always well produced and provide enjoyable nostalgia of a byegone era. I would very highly recommend this to our readers.